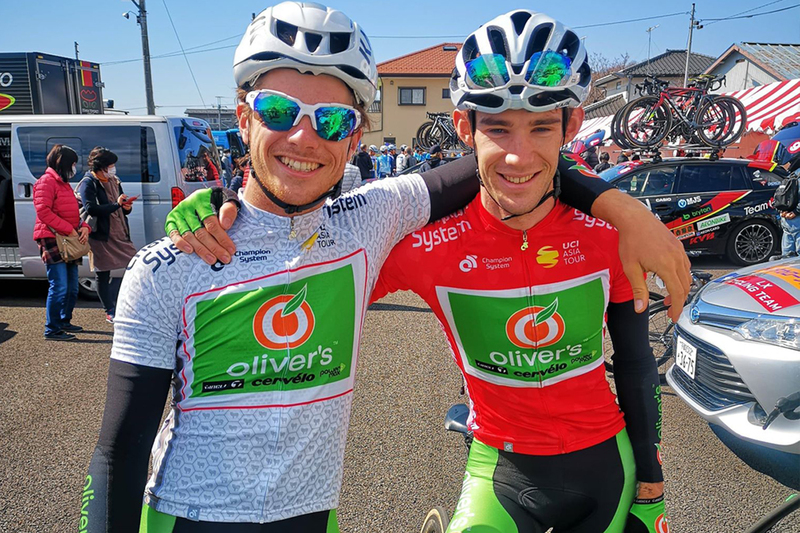 Oliver’s Real Food Racing has enjoyed a successful campaign in Japan at the third edition of the Tour de Tochigi, the team’s first UCI AsiaTour event for season 2019. The 3 day tour held in the Tochigi Prefecture in the countries north, began with a short 3km time trial around Igashira Park, in the city of Moka. Angus Lyons set the benchmark early on with a best time of 3 minutes and 48 seconds, with an average speed of over 47km/h. His time would last almost the whole day, and was only bumped down to a 5th place finish when the final few riders came across the line. 20 year old teammate Ryan Schilt, in his UCI road event debut, claimed 6th on the stage and was the best under 23 finisher, which handed him the white best young rider jersey for stage 2. The second stage, a 14km circuit race in the Yaita region would see the peloton complete 8 laps at a furious pace. It was not until lap 4 that a group formed off the front of the race. The breakaway of 14 included race leader Ben Dyball (Team Sapura Cycling) Robbie Hucker (Team Ukyo) and Angus Lyons for the Green Team. They extended their advantage out to 3 minutes before the peloton reacted and began to chase them down. Lyons claimed points at both King of the Mountains points, and secured himself the lead in the classification, before the escape group was caught in time for a bunch sprint. Ryan Schilt’s 11th place was enough to allow him to retain the lead in the youth classification. The team went into the third and final stage looking to defend both leaders jerseys. After another aggressive start a group of 6 riders which included Conor Murtagh for Oliver’s eventually broke away and gained a 90 second advantage. Unfortunately the Oliver’s boys had to chase down the break that included their teammate before the final King of the Mountain climb in order to setup Angus Lyons to win the classification, after another rider in the breakaway with Murtagh threatened his lead. Lyons collected maximum points on the final climb of the tour, and then shifted his full focus on helping Ryan Schilt get to the finish without loosing any time on his best young rider jersey rivals. The duo finished in the peloton just behind a breakaway of 10 riders that contested the win, none of whom were in the under 23 category so were therefore not a threat to Schilt. The 20 year old from Melbourne who rides under a Dutch licence, winning the classification at his first ever tour for Oliver’s. Lyons finished 6 points clear in the King of the Mountains classification. Sam Layzell – Team Manager: “We really had to burn up the whole team on the last day, but it’s very satisfying to be able to influence a race like we did, and to come away with two jerseys, and considering there was such little prizemoney on the team classification, it was great. Great to watch the boys take the race on, and of course to come away with two jerseys, it’s another great result for the team.